This pianist/composer/arranger has amassed jazz and Latin music credentials that are of Guinness Gook proportions. From his solo work to the now legendary duets with the late Major Holley, to Rahsaan Roland Kirk, Tito Puente, symphony orchestras and the various aggregations of his own, Hilton is a master of many styles but a slave to none. He is just as comfortable in an acoustic trio setting playing straight-ahead jazz standards. When it comes to caressing the ivories, Ruiz has got the class of Erroll Garner and Noro Morales with the sophistication of Duke Ellington and Ernesto Lecuona all wrapped up in to one. You're hear these elements and more upon listening to Hilton Ruiz Live At Birdland. 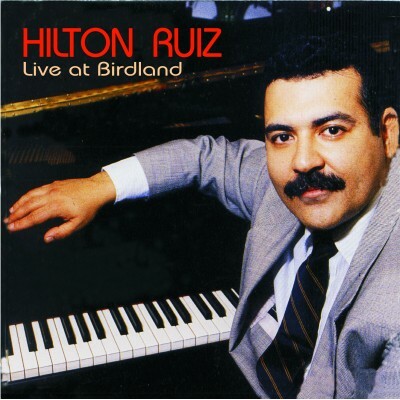 For this live date at Birdland, Hilton assembled some of the top musicians in New York, all of whom share his mastery of both the jazz and Latin idioms; David Sanchez (tenor sax), Peter Brainin (tenor sax), Andy Gonzales (bass), Steve Berrios (drums) Giovani Hidalgo (percussion).